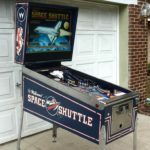 This is my restored Space Shuttle with many new parts and my custom shaker motor installed (watch for the camera shake during multiball). This is a complete restoration including a playfield swap with a new CPR playfield all done by me. The Pinball Shark. If you have a game you want restored, contact me.